Traveling up and down the steep hills of San Francisco in a cable car is one of the most endearing rides a traveler could experience. The vehicles have become the worldwide icon of this American city. Hanging out the side (as the man is doing in the photo above) is allowable and can be fun. But hopping on and off when the unit is moving is illegal. Two lines require giant turntables to reverse the direction of their vehicles when they reach either end of the line. You can watch or you can enjoy helping push them around. The power comes from an extremely long cable loop that continuously moves in a trench under the street. When the operator wants to move, he mechanically grips it. When he wants to stop, he releases the grip. The cable is pulled by colossal, power-driven wheels. This takes place in a powerhouse building (which you can visit). The cable car was born in 1873 in San Francisco to haul passengers on hills that were too steep to be safe for horse-drawn trolleys on rainy, slippery days. 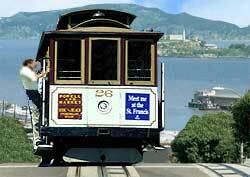 San Francisco once had dozens of cable car lines, with a collective length of 80 kilometers (50 miles). Today, three exist. The mayor tried to eradicate the remaining cable car system in 1947 because modern, more efficient means of transportation were available, but public outcry stopped him.